Men and powers : a political retrospective · One Book. One Author. One Hour. Notes and underlining concerning: misunderstandings of European interests by American leaders. Two years after book finished, Tiananmen; China not a world factor for 20-30 years; hope rest with Gorbachev. George Bush, needs to address foreign policy. Not a historian, 26 year-old prisoner of war (WWII); by 1950s realized fate of Germany connected to US. Germans must not forget Hitler/War. American vitality. McCarthy like Nazis. 1953 elected to Bundestag. Admiration for Marvin Kalb, Joe Kraft, Flora Lewis, James Reston. International Herald Tribune, best newspaper in the world. David Rockefeller. German Social Democracy. 3 characteristics of Ronald Reagan: 1. ability to simplify, 2. unshakeable belief in America, 3. ability to speak like normal people speak. TV. Jimmy Carter. Political reporting in Europe better than that in US. Americans hear little of opinions of other nations. US rich, greatest debt; Japan and W. Germany greatest creditor nations. Power consolidations have limited lifetimes. Soviet Union may try to reacquire arms superiority. 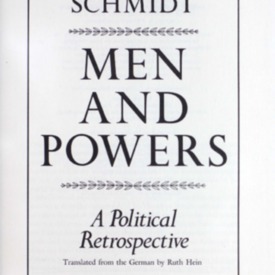 Schmidt, Helmut, “Men and powers : a political retrospective,” One Book. One Author. One Hour., accessed April 24, 2019, http://booknotes.gmu.edu/items/show/204. Program air date: April 15, 1990. Recollections of the former West German chancellor, Helmut Schmidt. "Schmidt, Helmut, 1918 Dec. 23-"